In Episode #339, Eric and Neil discuss how to leverage micro influencers. Micro influencers are those who have anywhere from thousands to 10K followers. When you get into the millions, you’re dealing with macro influencers. Tune in to learn if you should be reaching out to macro or micro influencers for the promotion of your business and why having just one influencer isn’t enough. 05:50 – That’s it for today’s episode! Find influencers who will not just drive people to your website, but will also convert those people into customers. Just like with ads, paying influencers is an investment that gets key people in your space talking about you. Micro influencers are much cheaper than macro influencers and will work in more specific niches. Automated : Get ready for your daily dose of marketing strategies and tactics from entrepreneurs with the guile and experience to help you find success in any marketing capacity. 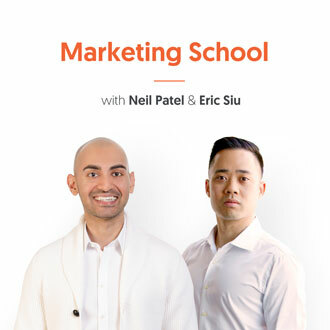 You're listening to Marketing School with your instructors Neil Patel and Eric Su. Eric Su : Welcome to another edition of Marketing School. I'm Eric Su. Eric Su : Today we're going to talk about how to leverage micro influencers. So I think first and foremost it's very important to identify what micro influencers are. So a big time influencer you might think, basically anybody that has an audience right? So if you look at Kim Kardashian she has millions and millions of followers on Instagram, she's considered a macro influencer. Micro influencers might be people that have a couple of thousand followers, maybe 15, 20K plus, and up to a certain threshold. Go ahead. Neil Patel: Yeah, it's more so people who have a following within a specific niche. So a good example of this is Eric and I, we're micro influencers. We don't have a huge following that can impact the world, but we have a following that's small and it's big enough within our niche, which is online marketing. Eric Su : One good point, I mean there's a platform that I invested in recently, they're focused on micro influencers. So they've defined it around a certain range, so I think there's a lot of definitions right now. So I think your mileage may ... I think Neil's definition is fair as well. So the question is how do you go about leveraging micro influencers? Neil have you worked with any micro influencers in the past? Neil Patel: I have and I've seen a lot of other companies work with them as well. Like in spaces like fitness, my buddy who owns Legion Athletics, Legion supplements, or Muscle for Life all same company. What they do is they pay people to post in Instagram and Facebook to promote their protein products and supplements. What they've found is when is they went after like major influencers who had like four or five million followers to post about their supplements, none of their sales increased. But on the flip side, when they had people with 30, 40, 50 thousand followers, and some were even lower like 10,000 followers, but they were body builders. Whether it's a male body builder, or a female body builder, post pictures with the work out supplements and leave like relevant descriptions talking about their products, they generated sales and the cost was a lot lower. So what they learned from the process is, it's not about quantity, you don't want to go after the biggest influencers, you want to go after the influencers that are the most relevant. By doing that you'll generate sales versus all this "white noise or buzz" that doesn't really do anything. Eric Su : Yeah, and today's day and age it's still, the stuff is still fairly new. A lot of people are trying to build these platforms, hopefully one of them works out, 'cause a lot of the platforms today ... The funny thing is you see a lot of agency people out there that are building these influencer platforms, but at the end of the day you don't have technology or product people helping to assist with these, they're kind of offshoring it. It's not really working out that well, so right now at least one of the episodes we talked about, Instagram for example. We talked about how to do B to B marketing through Instagram, you know using the power and leverage, and the power of the DM, finding people that are influencers in your area. You can use tags, you can find people that are just similar to other micro influencers just by tapping the little carrot button when you look at a profile. There's just so many ways to do it and just the art of the DM right? There's actually a good video from Gary [inaudible 00:03:32], it's like nine minutes or so, about using the art of the DM. There's some templates in there that you can follow to find these influencers and start to work with them. Neil Patel: Yeah, and whenever you work with micro influencers keep in mind one isn't going to move your business and even if you have a small marketing budget or a large one, it doesn't matter. You can't just work with one, if you're not going to work with 10 plus at a time don't waste your time. The reason I found this is when everyone within your space talks about you, it's much more effective than one or two people do it. When they do talk about you, you can't spread it out over a month, you want to get them to do it all during the same day ideally. Eric Su : Right, it's the same thing with ad's, you can't just say you're going to run one campaign and it's going to work out. You have to test, you have to keep refining over and over, and then go from there. But there's actually areas that you can probably look for, different pricing guides of how to work with micro influencers. We're not going to talk about that too much here, but Neil you have anything else to add? Neil Patel: No, pretty much it. Eric Su : All right, so that's it for today, and before we go we have a special giveaway. It's a one year annual subscription of Drip, which is my favorite E-mail automation tool. Includes lead scoring, tagging, split testing, revenue reporting and more. If you want to get a copy of this all you need to do is rate, review and subscribe to the podcast, we're going to pick one winner and then text marketingschool, that's one word, marketingschool3344 to prove that you did it. If you're international just E-mail me, [email protected] to prove that you did it. That's it for today, we'll see you tomorrow. Automated : This session of Marketing School has come to a close, be sure to subscribe for more daily marketing strategies and tactics to help you find the success you've always dreamed of. Don't forget to rate and review so we can continue to bring you the best daily content possible. We'll see you in class tomorrow, right here on Marketing School.